SP series semiautomatic L-seal cutting machine can convey the products automatically into shrink tunnel through conveying belt for shrink packaging after sealing cutting. Equipped with shrink tunnel to reach higher working capacity. Adopt nanofiber cutter holder and anti-sticking thermostable nichrome cutter for sealing cutting to ensure good sealing without cracking or cooking. The height of conveyor belt can be adjusted with handwheel. Sealing cutting time is controlled by time relay accurately. Sliding film support can keep all kinds of shrink films, up to 550 mm in width. Upper sealing cutting frame is controlled by return cylinder. BSL series semiautomatic L-seal cutting machine is suitable for shrink packing electronic products, hardware, software, foodstuff, printing, pharmacy, floor, ceramics etc in small amount. Applied to all kinds of packing materials, such as PVC, POF, PP. 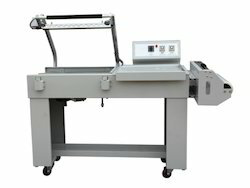 Looking for L Sealer Machine ?